One question that we get asked is, “What is the difference between Dexalytics and a spreadsheet?” First of all, a spreadsheet, by definition, is a computer application for organization, analysis and storage of data in tabula form. While Dexalytics does allow one to store and organize body composition data like a simple spreadsheet, Dexalytics is much more. In these next two blogs, we will first look at some of the fundamental differences between Dexalytics and a spreadsheet and then, in blog II, we'll look at some practical examples as to how the integration of Dexalytics can help with your current workflow. Automated Data Reporting - Dexalytics takes the raw DXA data and transforms it into an individualized report for each athlete. Dexalytics presents information in an easily understood format for athletes, coaches, strength, and sports performance staff. The player profile page points out imbalances in muscle and bone that the strength and conditioning staff, as well as the sports dietitian, can use to develop individualized plans for each athlete and then track the success of these plans. Dexalytics visualizes historical trends that allows you to look at how an athlete has changed over time. Dexalytics has automated visuals for tracking over 25 variables for each individual and for a position/event/team which can be customized if you want to look at the data differently. This allows the performance staff to spend more time identifying who needs what and then working with the athletes. 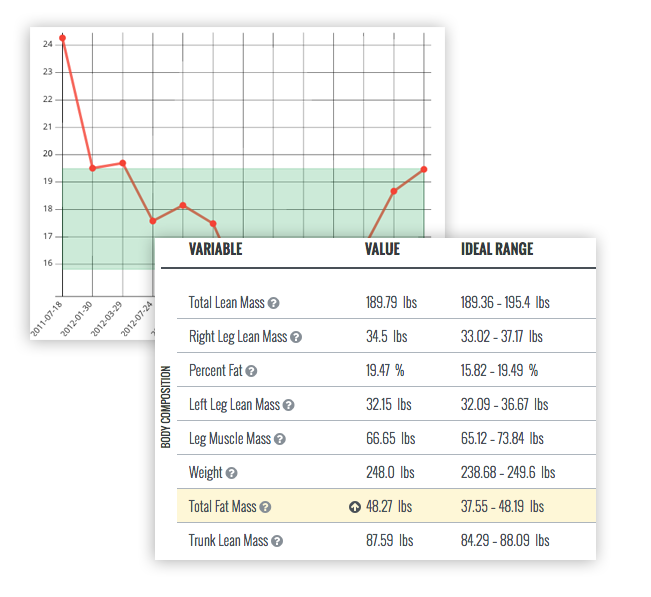 Forecasting - A recent Dexalytics addition is the ‘Forecasting’ feature, which takes a player’s own data and forecasts how changes in weight will affect body composition. This feature is built on years of research in this area (Bosch et al., 2014; Dengel et al., 2014) and is useful when considering adding or decreasing the weight of an athlete and what the possible outcome of that change will be on overall muscle and fat distribution. Dexalytics Score - The Score is a sport and position (event) specific composite score that addresses lean soft tissue, bone and fat masses and distribution of these masses which can help coaches evaluate their team right away in regards to body composition of their athletes by position or event. This data can be useful in determining what type of athletes a team should be looking at when they are recruiting or examining potential draft choices. This “Dexalytics Score” can also be useful in evaluating current training and nutrition programs. The Dexalytics score adds context to the data, allowing us to look at the data across multiple levels (totals, regional, ratios) within that context. The important part of the score is that the context is provided by the user and how they want to look at their data. The user can compare starters vs non-starters, or compare current players to a team’s historical top performers. This proprietary scoring system relates body composition to on-field performance and is based upon years of research in sports performance and body composition (Bosch et al., 2014; Dengel et al., 2014). Alerts - Designed to highlight potential issues and to provide guidance to the athlete and team, ‘Alerts’ automatically notifies sports performance staff, coaches and athletes to asymmetries and areas of concern for a particular athlete. Advanced users of Dexalytics can also build custom alerts on particular areas that they feel are important to performance. Ratios - Dexalytics calculates a series of unique ratios that have been developed through years of research (Bosch et al., 2014; Dengel et al., 2014). 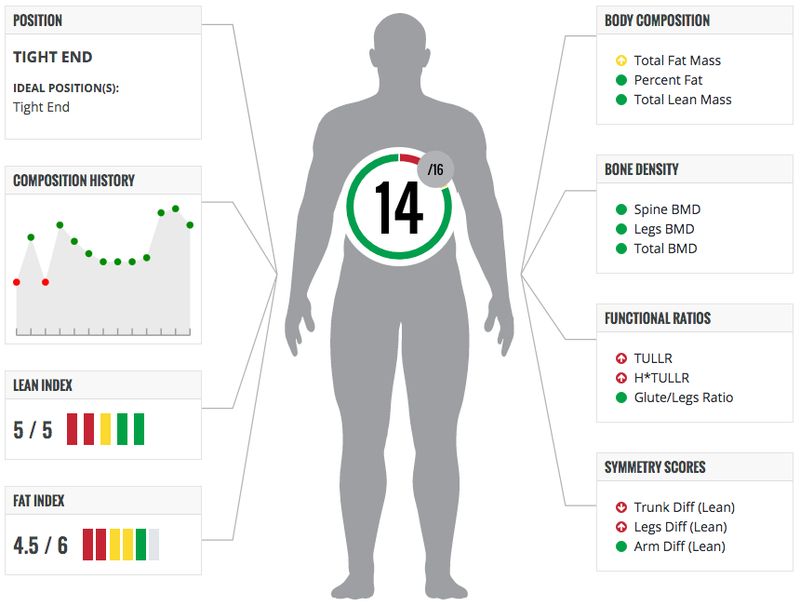 These ratios add another layer of body composition analysis that is not available in simple spreadsheets. In part II of this blog series, we will explore some practical scenarios that will demonstrate some of the features of Dexalytics and how to use these features. These scenarios are intended to help advanced Dexalytics users as well as individuals trying to understand how to get the most out of their body composition data. Dengel DR, Bosch TA, Burruss TP, Fielding KA, Engel BE, Weir NL, Weston TD: Body composition of National Football League players. Journal of Strength and Conditioning Research 28(1):1-6, 2014.